Crossroads ist ein kleines Hostel in perfekter Lage. Besonders abends zeigt sich die tolle Lage des Hostels, wenn man sich gemütlich zum Abendessen oder mit einem Bier auf die alte Stadtmauer direkt nebenan setzen kann, um bei toller Stimmung den Sonnenuntergang zu genießen. Das Hostel ist super gemütlich und familiär mit viel Charme, mit großem Wohnzimmer und schöner offener Küche. Jeder hat sein eigenes Schließfach. Super hilfreiche Mitarbeiter! Sehr sauber und super Preis! It was my second time at the Crossroads Hostel and everything was perfect! Highly recommended! Super friendly staff. A lovely place to stay. One of the best hostels I ever stayed in. It's more a very cozy, beautifully furnished, clean apartment than a hostel and I felt home immediatly. Best thing is having a coffee on the sunny balcony in the morning with view on the sea..and the staff is super friendly and helpful! Thank you so much! The staff is really nice and the place is cozy with a balcony facing the sun and a terrace with a beautiful view over Saloniki to the sea. 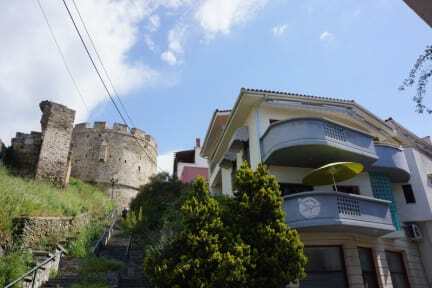 Very close to the old town, nice restaurants and the old city wall which also offers a great view. Thanks for the nice stay! 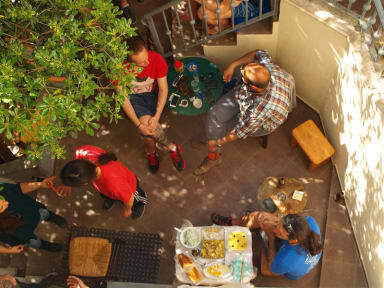 Very nice Hostel located in the old town of Thessaloniki. You need a while getting there from the train/bus station, but it's worth it because of the view. The staff is friendly and always helpfull. The beds are not the most comfortable but still I had some good sleep there. Would recommend it and always come back ! Very nice hostel in the upper town. Staff is very helpfull. It is tight in the upper town but if you can you should come here with a car.